This method is very similar to practice to Method 3 Lay Sequential in that we are laying each match in our accumulator, one by one. However, with some clever maths in the OddsMonkey Acca Finder, we are spreading the value of the free bet across every match. This means we guarantee a £1.10 to £5.20 profit on every accumulator! The reason for the range in profit is because your profit depends on choosing teams with low odds and close back & lay odds. Firstly, before a team has lost, we 'underlay' each match, this means if the teams win, we make a profit. Secondly, once a team has lost, rather than hoping the remaining teams win so we get a free bet as per Method 3, instead we 'underlay' now using the value of the free bet, so that if a team loses then we still make a guaranteed profit. The maths is a bit tricky but don't worry, the OddsMonkey Acca Matcher does all the calculations for you, so all you need to do is follow it! 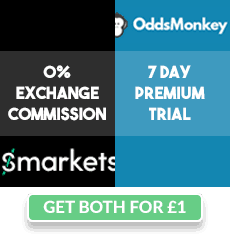 Risk Free - You will be guaranteeing a profit every time! As Profitable - As profitable as Method 3 Lay Sequential, but without any risk. Time Consuming - You need to place a lay bet before each kick off until two teams have lost. Note the below example uses screenshots from the OddsMonkey Acca Builder, however the newest OddsMonkey tool, the Acca Finder, is best for Lock In Method. We are placing a lay bet before each game until 2 teams lose. The OddsMonkey Acca Matcher will show you the lay stake for every match, depending on whether the previous teams have won or lost, but if you're interested to know exactly how it works, read on! The below outcomes are using an example of a £25 acca with 5 teams between 1.22 to 1.3 back odds. Once 1 team loses, then we can no longer win the £52.25 profit from our bookmaker bet. Instead, we can only win the £50 free bet (worth £40 cash) and if we lose one more game then we win nothing. Therefore, our lay stake decreases a lot as we are now betting against a much smaller potential win. Bookmaker = Our accumulator bet has lost £25 but we have received a £25 free bet worth £20 cash profit. Note it doesn't matter which of the 5 teams lose, you will always make around £5 profit. You will need sufficient balance in your Exchange to cover the amount of your accumulator winnings, less up to £5 (given this how we make profit if all the teams win). For example, if your £25 accumulator has average back odds of 1.3, which is 3.71 combined odds, then you stand to win £68. The calculation for this is £25 * (3.71 - 1) on the bookmaker. Therefore, in your exchange you will need £64 (as the profit with average back odds of 1.3 is £4). Gubbing - A few bookmakers have noticed matched betters are placing accas where every game kicks off at a different time, so you may be more likely to be gubbed. To start profiting from football accumulators using the Lay Sequential Lock In method, check out the OddsMonkey Acca Finder article.